I love to roast a whole chicken because of three reasons. One – I get to serve the chicken as a meal without the fuss of cooking other dishes. Two – I keep the gravy collected from the roasting and the chicken bones to make a very delicious soup. Three – The balance of the roast chicken, especially the breast part can be made into nice chicken salad or chicken sandwiches. Therefore, after the whole affair, I can say, not even a bone is wasted. Normally, I like to season my roast chicken with minimal flavourings. For the above, I merely use thyme, brandy, salt and pepper. When the chicken is almost ready, I give it a splash of lemon juice, butter and honey. If you seasoned your chicken well, i.e. leave it overnight in the fridge, it will be so delicious when slathered with honey and butter when it is almost ready. I served the chicken with some garlic butter rice, i.e. rice fried with garlic, butter and some eggs. For the greens, I use balsamic salad dressing. I normally cut out some of the chicken to serve as main meal. Then, there are parts where I use my hands to tear off the meat and turn them into chicken salad by adding some mustard and mayonnaise. After that, I take the chicken carcass and the roasting juice and make a pot of soup. By adding some carrots, onions, garlic and leek or celery, I will get a very wholesome pot of soup. Put it in the freezer or leave it in the fridge for a while to allow the fats to harden. Skim off those unsightly, heart clogging fats, strain and add some alphabet pastas to the soup. Voila, the best alphabet soup in the world. 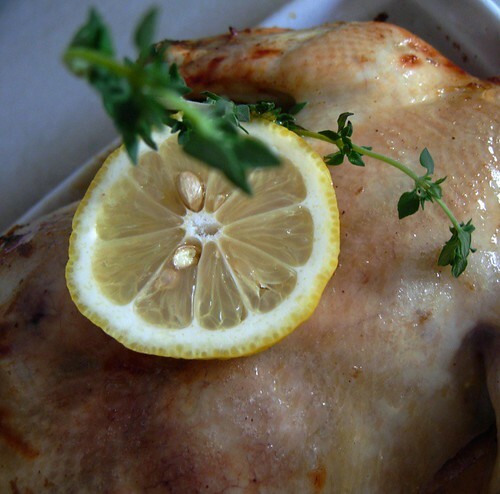 I have a lot of roast chicken recipes and usually they are all very easy to make. Do give it a try. 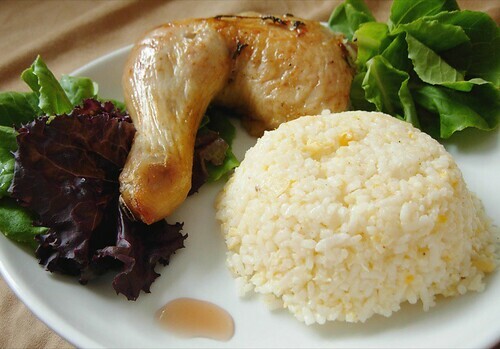 your chicken with some garlic butter rice look so yum yum…. 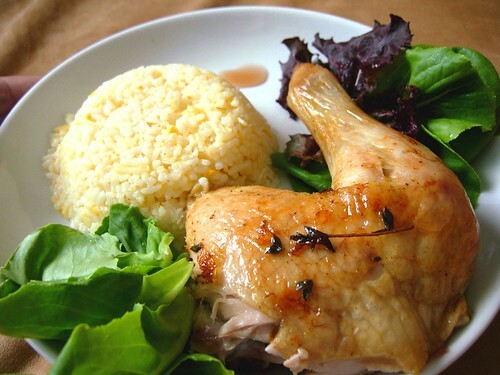 Wow… your plate of roast chicken with the rice looks delicious lor. Will try out this convenient method of making a wholesome pot of soup using the remaining chicken carcass and roasting juice. OMG! Your chicken with butter rice looks so yummy. Very good presentation! Feel like I wanna take a bite at the drumstick. How to prepare “garlic butter rice”? Looks good-leh! For halal version, what will be the best substitute for brandy? drbubbles – Actually, you can omit the brandy. Try a dash of fish sauce, it smells good when roasted. domino – Easy nia. Just heat butter and some olive oil, stir fry some chopped garlic, put in rice, knock in some eggs and season with some Maggi seasoning and salt. Kautim. allie – Hehehe, it looks really juicy ya? ck lam – Make a small pot so the soup is not too diluted and put some pasta in it. It is really delicious. PTP – Yalor, Chinese very clever to make use of every ingredients wan. Somemore, that day Tesco’s chicken only RM5.99 per kg while RM12.50 at the wet market wor. So, I buy two lor. Hahaha, kiasu. I have been using a smoker of late to cook my chicken and i just don’t see how you can do it better. I don’t care how slow i try to bake or grill my chicken it just comes out dry. Smoking on the other hand is always moist and good. I guess its a time thing. FULLY SUPPORT YOUR 3 REASONS as I am also your gang. So easy to prepare and it’s yummy. Apa lagi mau complaint?